This was the second circuit stop for Laser District 15 as well as the second circuit stop for the ﻿Texas Sunfish Racing Circuit. 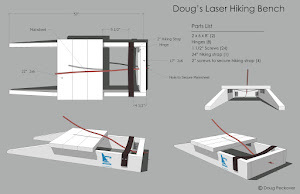 This venue is known for being windier, wetter and colder than what is forecast so I opted to sail with the Fish and Doug sailed with the Lasers. The rain stopped by the time racing began and the winds settled in nicely and it turned out to be a pretty weekend. There were a number of Laser sailors from out of town that made the trip for this regatta. Although the group from Seabrook Sailing Club down in Houston said they didn't see anything resembling a wave or chop, Doug was nonetheless attempting to catch these nonexistent waves. While Doug and John (from Kansas) tried carving back and forth looking for small gains, Dave (from Houston) just went straight downwind. The net result was very little difference. Doug wore his hat cam to try to capture the carving technique but Dave was right about the "waves." 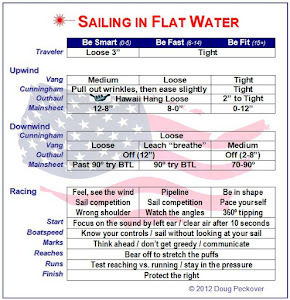 Doug keeps telling me he's going to write a post about what he learned at the Worlds and has figured out on the whole downwind thing but the weather hasn't provided him with enough of an opportunity to experiment. This weekend the Texas Corinthian Club in Houston is hosting the Gulf Coast Championships. Perhaps there will be some waves. On the Fish course, I was experiencing a whole different kind of sailing experience. The bulk of the fleet were women and new sailors so we decided to use the Opti green fleet rules and allow coaching in the back half of the fleet. 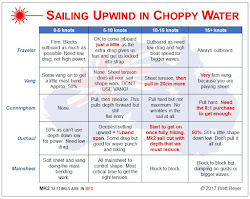 I had several good downwind battles that were just plain fun. The start lines were friendly, there were cheers for each other at the finishes and high fives and hugs when we returned to land. It made for a really pleasant racing experience.